As anticipation builds for the men’s Olympic marathon in London on Sunday, we get word that U.S. medal hope Meb Keflezighi enjoyed a good final long training run at altitude before he left for the Games this week. “He’s going to run great,” tweeted Scotty Bauhs, who accompanied him on the 14-miler at 9,000 feet in Mammoth Lakes, California. 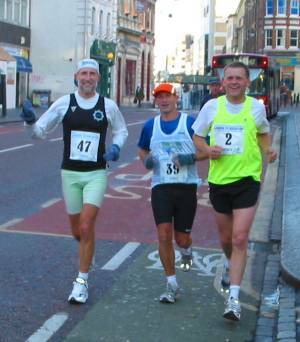 They covered the distance starting at 7-minute pace, then moving up to a minute-per-mile faster. “It was definitely an easy run for him—he should be ready to go,” reports Scotty. 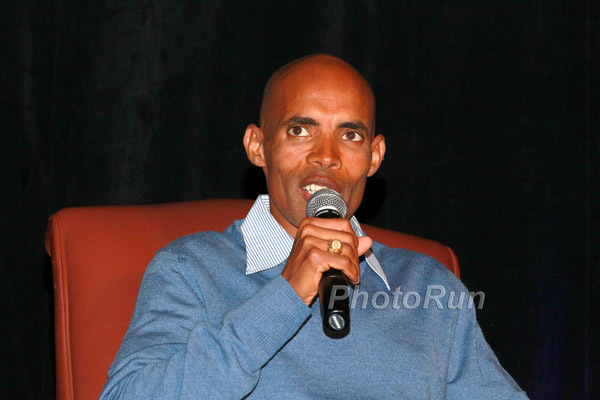 Meb, a dedicated student of the sport, likes to believe that history may be on his side. His shelves are lined with books written about the classic 26.2-mile distance and, understandably, the 2004 Olympic silver medalist is drawn to the lives of marathon stars who have had long careers and achieved the pinnacle of Olympic gold. 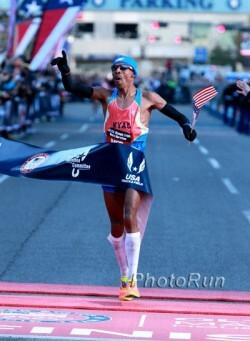 When I talked to him after this year’s Boston Marathon, Meb told Take The Magic Step® that he has taken a keen interest in the life and feats of one such man: Carlos Lopes, of Portugal. 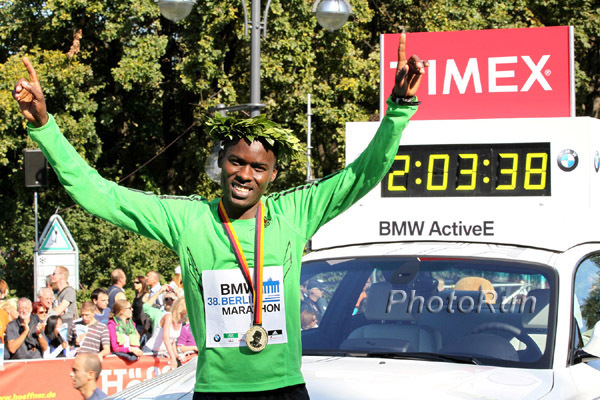 He won the 1984 Olympic Marathon in Los Angeles in 2:09:21—a record that would stand for 24 years until Kenya’s Sammy Wanjiru broke it in Beijing in 2008. On a hot and humid day, Carlos—running in only his third marathon and just weeks after suffering cuts and bruises when he was hit by a car in Lisbon—led John Treacy of Ireland and Charlie Spedding of Great Britain into the L.A. Coliseum. A former stonecutter’s helper, he took home his country’s first ever Olympic gold medal. And some details Meb has unearthed about the Portuguese hero’s epic win have given him a psychological lift in his preparation for London. “I’ve been thinking a lot about Carlos Lopes,” said the popular distance star who was honored as Grand Marshall of this year’s Boston. “Lopes won the Olympic marathon on August 12, 1984. Guess what date the Olympic marathon is this year? August 12!” He paused for a moment, his eyes twinkling. Then… “How old was Lopes?” He answers his own question: “He was 37. 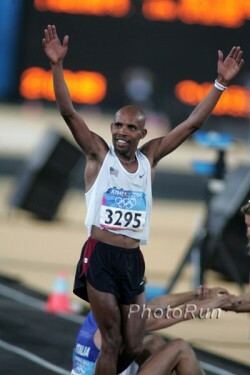 And I’ll be 37 when we’re at the starting line in London!” Meb is obviously fascinated by the intriguing alignment. 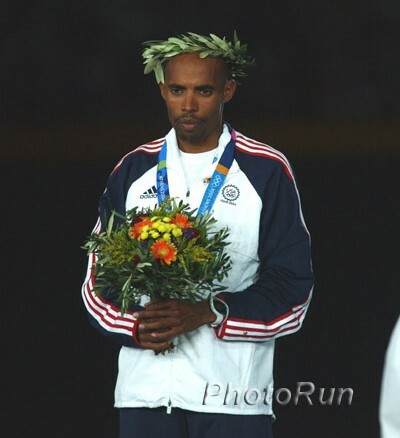 It is eight years since Meb dramatically captured Silver at the Athens Olympics in 2:11:29, the first American to medal in the marathon since Frank Shorter in 1972 and 1976. A pelvis fracture suffered during the U.S. 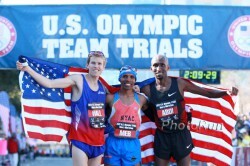 Trials in 2008 kept him from competing in Beijing, and he says earnestly, “That was taken away from me and I have a deeper appreciation now for being on the team.” At 36, he earned his passage to London this year by becoming the oldest Olympic Trials winner in U.S. history, notching a 2:09:08 victory in Houston. Beyond the Olympics, he says, he just hopes to be competitive for a couple more years. And he is taking his cue from another dip into the history books. Another of the marathon greats whose career he has studied closely, he confides to Take The Magic Step, is Khalid Khannouchi, the two-time world record holder and the first man to break 2:06:00. Meb and Khalid—nicknamed “Special K”—have a lot in common. Both came to the U.S. from other lands, Meb from Eritrea when he was 12 and Khalid from Morocco at 20. Both became U.S. citizens and ran proudly for their adopted nation. And—playing the numbers game again—Meb will surely have noted that Khalid was 40 when he finally announced his retirement in March.